Committed to teaching yoga as a method toward conscious living, Advanced Certified Jivamukti teacher Carly Boland offers her classes with sincerity, devotion, and compassion. In her class you can expect to move with breath (vinyasa), sweat, and reflect. 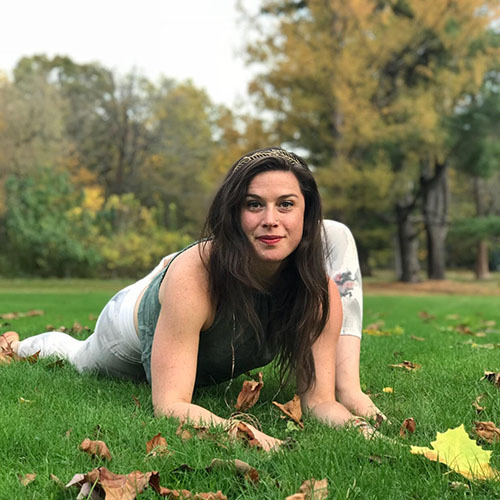 Her light-hearted and comprehensive teaching style weaves yogic philosophy, Sanskrit, anatomy, skillful hands-on assists, inspiring music, and dedication to the lineage of her teachers artistically igniting fearless curiosity about Self, and connection to all those who share in this community of life. In her teaching, Carly creates an environment of community, both playful and profound. Drawing from her integrative dance, somatic and holistic health background, expect a well rounded class. The ultimate aim in every class is for all present to leave each class a little more of a vibrant, kind, steady, and joyful version of themselves, as teacher and students alike move on the compassionate path towards enlightenment.Carly has the rare opportunity of living and breathing yoga at the feet of her teachers, immersed in rich direct teachings from the founders of Jivamukti Yoga, Padma-ji Sharon Gannon and Shri David Life, to whom she is eternally grateful for their endless mentorship, generosity, teachings, wit, and love.